Samit Basu is an Indian novelist best known for his fantasy and science fiction work. His first novel, The Simoqin Prophecies, published by Penguin India in 2003, when Samit was 23, was the first book in the bestselling Gameworld Trilogy and marked the beginning of Indian English fantasy writing. The other books in the trilogy are The Manticore’s Secret and The Unwaba Revelations. Samit’s global breakthrough happened with the superhero novels Turbulence and Resistance. Turbulence was published in the UK in 2012 and in the US in 2013 to rave reviews. It won Wired‘s Goldenbot Award as one of the books of 2012 and was superheronovels.com’s Book of the Year for 2013. Its sequel, Resistance was published in the UK/US in 2014 and was just as well received. Samit also writes for younger readers: other works include the ongoing Morningstar Agency and Adventures of Stoob series. 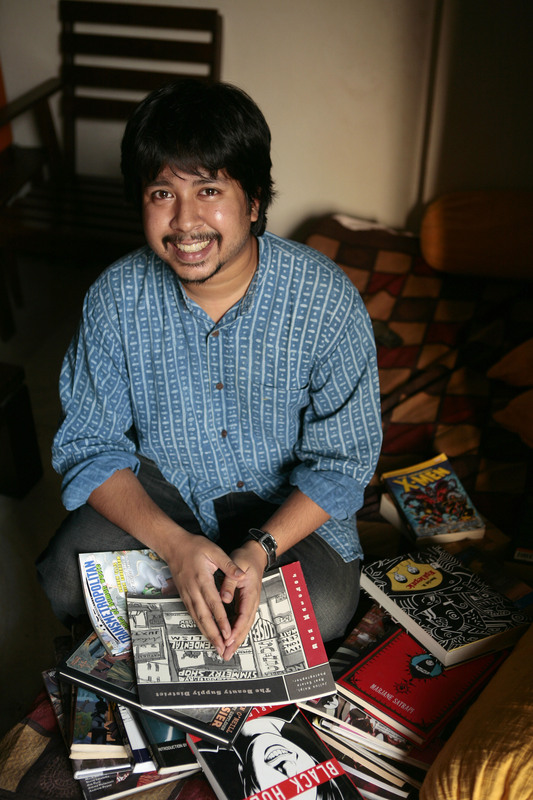 Samit’s work in comics ranges from historical romance to zombie comedy, and includes diverse collaborators, from X-Men/Felix Castor writer Mike Carey to Terry Gilliam and Duran Duran. His latest GN, Local Monsters, was published in 2013. He’s currently working on a number of book, TV, film, comics and new media projects.